Dr. Martin has led a long and productive career at the University of Washington, where he received his BS and MD degrees and has been a member of its faculty since 1957. 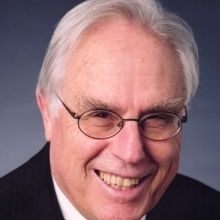 He worked as a surgical pathologist and cytogeneticist in the UW Department of Pathology since 1957, and he served as the founding director of the Medical Scientist Training Program and the “Genetic Approaches to Aging Research” Institutional Training Grant of the National Institute on Aging. He was elected to the Institute of Medicine of the National Academy of Sciences and now serves as a Senior Member. Dr. Martin was a member of the National Advisory Council, the Board of Scientific Counselors of the National Institute on Aging, and the Scientific Advisory Board of the Ellison Medical Foundation. He currently serves as the Scientific Director of the American Federation for Aging Research. He was the Founding Editor-in-Chief of an AAAS/Science website for research on the biology of aging (SAGE KE). Dr. Martin is a Past President of the Tissue Culture Society of America, American Federation for Aging Research and the Gerontological Society of America. Dr. Martin’s research has for many years been concerned with the development of genetic approaches to the study of aging and age-related diseases in mammals. One theme has been the plasticity of the genome of somatic cells. His lab has contributed to our understanding of a number of mechanisms for the heritable alteration of genetic information (Nature, 1967; Science, 1969; Chromosoma, 1973; Proc Natl Acad Sci USA, 1983; Cytogenet Cell Genet, 1983; Somatic Cell Mol Genet, 1984 & 1986; J Exp Path, 1986; Dev Genet, 1987; J Biol Chem, 1989). During this period a parallel series of biochemical, cytogenetic and somatic cell genetic studies on cells from aging mammals addressed various somatic mutational theories of aging; these have demonstrated the importance of relatively large scale chromosomal types of mutation (summarized, in part, in Molecular Biology of Aging: Gene Stability and Gene Expression, 1985). An offshoot of this work provided the first data on mutation frequencies in human epithelial cells in aging human subjects (Human Mol Genet, 1996). At a more clinical level, Dr. Martin has systematized our knowledge of human genetic disorders from the point of view of their rich potential to elucidate specific aspects of the senescent phenotype and used this analysis to make inferences concerning the polygenic basis of aging. Later in his career as the founding director of the UW ADRC, Dr. Martin turned his attention to mechanisms of the aging of post-replicative cells, again using genetic approaches. He assembled a team of investigators to carry out a linkage analysis of familial Alzheimer's disease, an effort that led to the assignment of the commonest form to chromosome 14 (Science, 1992) and to the mapping and positional cloning of a related locus on chromosome 1 (Science, 1995). New candidate genes were sought using the yeast protein interaction trap methodology. This work has led to a series of papers on an adaptor protein (FE65) that is of importance in the modulation of the function of the beta amyloid precursor protein; polymorphisms at that locus were shown to play a role in the susceptibility to Alzheimer disease in very old individuals. These studies were complemented by attempts to develop cell culture models for the study of Alzheimer's disease and the pathobiology of aging, including the synthesis of the first “knock-in” and “conditional “knock-out” transgenic mouse models of human presenilin 1 dysfunction. The latter study demonstrated a correlation, in presenilin deficient mice, between diminished hippocampal stem cell replication and aberrations in memory.